Snorkeling is a tourist activity swimming at the surface of the sea as well as being able to see directly underwater life such as fish and coral reefs. Snorkeling is also a water sports activity that develops into a recreational water facility that is very popular especially on tropical beaches and can also be done in fresh water such as lakes and of course also in the ocean. Coral reefs, colorful fish, shellfish, seaweed, jellyfish, shrimp, starfish and even sea turtles and many other marine biota. That's all you can see without having to dive / dive into the sea but still on condition that the sea is shallow. And Snorkeling uses a number of equipment in the form of diving masks, diving fins (frog legs) to increase thrust on the legs and snorkel. 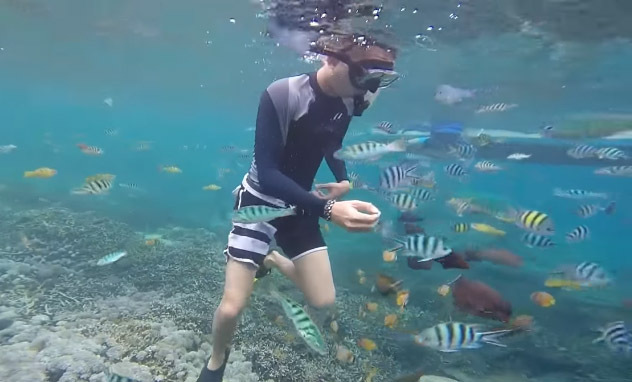 And there are several places in Bali that you can use as a snorkeling spot. Sanur Beach, the sea conditions depend on the wave season and of course it is cloudy if snorkeling in Bali Sanur during the wave season. Amed Beach, seeing beautiful coral with snorkeling you can visit Tanjung Vienna, Buntutan and Jemeluk. Tulamben Marine Park is the wreck of the Usat Liberty shipwreck, the underwater beauty in this tulamben. Padang Bai, with white sand texture that is very soft and clean. This Hidden Tourist Attraction offers you to do fishing. Menjangan Island, crossing from Gilimanuk port is about 30 minutes, and see very beautiful from coral to coral reefs. Penuktukan Beach, enjoy the view of the coral reefs and the exoticism of ornamental fish, only five meters from the coastline. Nusa Penida, Ceningan & Lembongan | become one of the spots if you want to see Manta (large Pari Fish) and Mola-mola and great coral reef. Before the activity started by Traveler, they will be briefed on the rules for playing snorkeling in safe Bali. Especially how to regulate breathing while in water, because it is certainly a little difficult, not breathing through the mouth? After all the equipment is worn and prepared, our guide team will take you to the center of the snorkeling location in Bali Nusa Dua, by motorized boat ride or glass bottom boat.